I have a yarn problem. I can’t throw anything away, no matter how little is left after a project is completed. Never. Just can’t. Not gonna happen. This problem of mine results in lots of random, small pieces of yarn from various projects accumulating in my yarn cupboard. And then I’m not even talking about the yarn that I bought for a particular project that somehow just never seemed to happen. So what to do? I have found THE solution to my problem, use all that random yarn in one project! I went through my stash collecting all cotton-based yarn that is less than 1 full ball and more than 1 meter long and chucked it in a plastic bag. (I have decided to define anything shorter than 1 meter as a yarn tail that is allowed to be thrown away.) I also frogged a few UFO’s that I abandoned for a variety of reasons as well as a few prototypes that I worked on in the past. The result of my foraging is an impressive rainbow of random yarn. In this bag there is lots of Scheepjes yarn which won’t surprise you considering how much I work with it, but there is other yarn in there too. I have Cotton 8, Sunkissed, Stone Washed, Stone Washed XL, Bloom and Catona which are all Scheepjes yarns, Drops Safran and Paris, some no-name brand yarns and even a small bit of Malabrigo Merino Sock and Baby Silkpaca. Granted, the Malabrigo is not cotton-based, but it was in the category “left-over-and-no-purpose-for-it”. Most of these yarns are available from Deramores and Wool Warehouse. And what am I going to do with it you ask? Use it all in one project! I took this bag with me on summer holiday and it was the most relaxing holiday project ever. I have made all this random yarn into a Tunisian Ten Stitch afghan, designed by my good friend Dedri Uys from Look at what I made. The original pattern makes a square blanket but I wanted a rectangle, so I adapted the pattern ever so slightly. I didn’t make the specified 10 rows to start the afghan, I made 50 rows. This way the afghan is always about 40 rows longer than it is wide. For the rest I used the pattern as specified, and it goes like a charm. I used a 6mm Tunisian crochet hook and double stranded yarn, except for the worsted weight yarn which I used single stranded. I changed color when I came to the end of a strand, to a corner, or just thought it was time to change color. The result is a very random blanket with thick and thin color bands scattered around like candy on Christmas morning. It kind of reminds me of a painter’s mixing board, all random colors that somehow seem to work together. Even the yarn tails have a painter’s palette feel to it. I will be honest, there are a lot of yarn tails in this afghan, but I made the agreement with myself that before I start a new row I first have to work away the tails from the previous row. 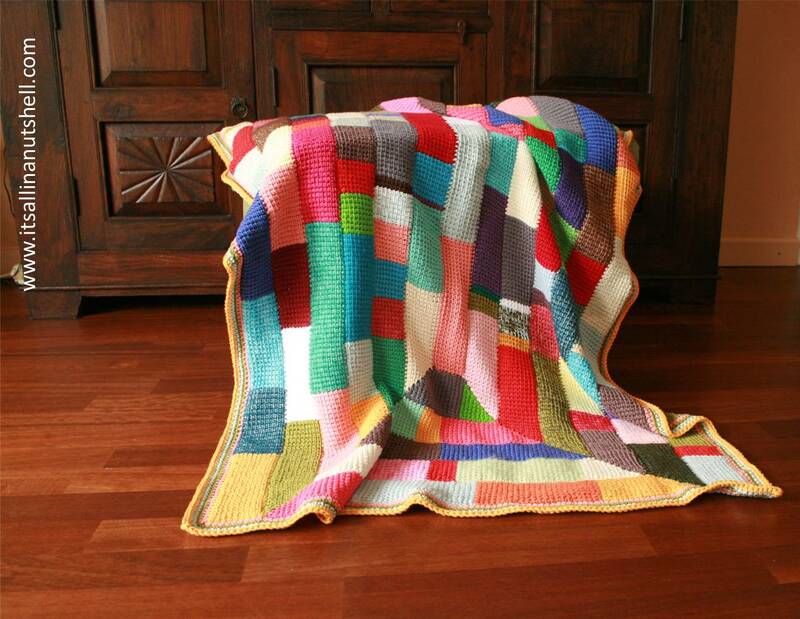 You can easily make your afghan as large or as small as you like. I stopped when it was a one-person lapghan. It’s currently laying on the couch and is used by my boys when they watch TV. They love getting under it and argue who can use it. I should have made it bigger to have room for two boys…. I still have some stash yarn left, although I have made a serious dent in my random yarn collection. I have completed a pouf that I showed you a few weeks ago and now this afghan. I still have a few ideas to continue my stash busting mission. Will keep you posted! Thanks for your stimulating blog. It was exactly what I had in mind for my ‘restjes'”.!!!!! Enjoy getting back into the flow. Tunisian crochet is fun when you get the hang of it. gorgeous… what a great idea. Thank you Esther. You always come up with great ideas. I love your blog and all your tutorials. I have tried tunisian crochet in the past and would love to brush up on my skills. What a beautiful blanket ! I really do have a large yarn stash of “leftovers.” With Winter coming soon , I may have some time to use up some of mine. I save my yarn ends as I have seen people that have used them to make a yarn bowl. If you type in ” yarn ends bowl” in search on Pinterest , you will see an example. They are very artistic. Have a wonderful day and thank you, Esther. That’s gorgeous, I love how the random colours came together like magic to make something beautiful. It’s amazing isn’t it 🙂 I’m surprised by how well it worked too!